Rockola continues to draw the masses to Concert in the Park every summer. Jim and Carmen graciously offered to set up our spot at noon and then Kellee, Pammy and Nina volunteered one-hour shifts until we could all arrive. We had quite a few early birds hanging out by 3:00 and our picnic was well on its way when the music started at 6:00. As with most of our culinary themes this summer, we found inspiration from the band's name and/or songs. For Rockola, "Take a Rock on the Wild Side" seemed appropriate. I had been working with a friend during the week, cooking for a family of 12 who was renting a vacation house on the beach, and wasn't even sure I was going to make it to this concert. At the last minute, when I realized I would be able to swing it, I quickly did a search for "rock" and/or "wild" recipes. I came across Saveur's article, 8 Great Recipes that Rocked the Internet, which included Dorie Greenspan's World Peace Cookies, a recipe she obtained from Pierre Hermé, the macaron maestro of Paris. Cookies that rocked the Internet seemed to be a perfect choice and making them would also provide me with the opportunity to use a few bars of the Kallari chocolate I received as a gift from the Kallari marketing team. I don't typically accept sample products, but it's hard to pass up chocolate of this quality. I used the 70% and 85% cacao bars in the cookies and may try the 75% cacao bar as suggested on the web site (the hints of passion fruit and cloves are a perfect compliment for Pinot Noir, Barolo, Bordeaux, Espresso & Stout). The cookies were rich and decadent, but spread out very thin during baking. I wasn't happy with their appearance and went in search of another recipe with more of a wow factor. When I set my eyes on the stunning photo of Rocky Road Cheesecake by Bakers Royale, I knew I had found the WOW. In place of crushed Oreo cookies for the crust, I crushed up some of the World Peace Cookies. For the filling, I used a HUGE bar of Valrhona chocolate Holli had given me the night before. Talk about chocolate heaven with a Kallari chocolate crust and Vahrhona chocolate filling! In addition to the baby marshmallows, roasted salted almonds, and chocolate ganache flavored with a bit of instant coffee granules, I added the ultimate "cherry on top" with a few Luxardo Gourmet Maraschino Cherries. After a few recent baking disasters in the kitchen, I was finally able to redeem myself with this cheesecake. Before digging into the cheesecake, we made our way around the table for some incredible savory fare. Kai prepared and presented his platter of Rock Shrimp Crostini garnished with caviar and scallions. He has the drill down pat and enjoys perfecting his styling and plating for the camera. When Carmen e-mailed me her original idea of what she was going to make, I must admit I wasn't too excited. 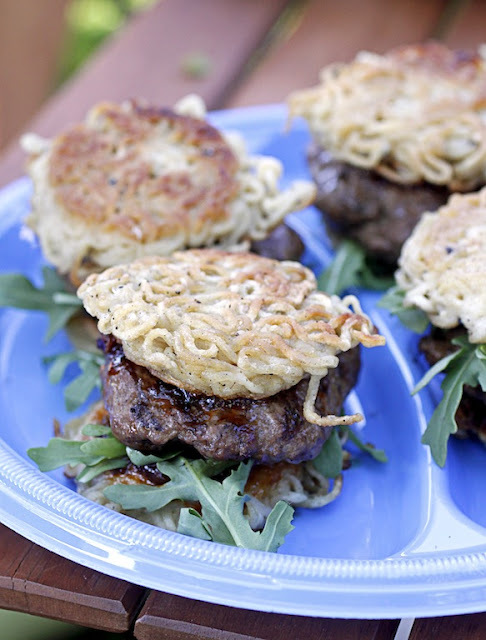 We often change our minds by the time Sunday arrives and Carmen's change of heart rewarded us with a taste of one of the latest and greatest food crazes - The Ramen Burger. It's a seasoned prime beef patty topped with secret sauce and choice of vegetable garnishes, sandwiched between buns made of ramen noodles. Carmen did her research and came up with her own fabulous rendition. Of course, Jim expertly grilled the patties table side and assembled the burgers to order. Holli was disappointed her Stone Crab Risotto wasn't as creamy as risotto should be, but nobody seemed to complain as they went back for heaping seconds and thirds. We had rocks and stones covered with my Rocky Road Cheesecake, Kai's Rock Shrimp, and Holli's Stone Crab Risotto, and wild side covered with Carmen's Ramen Burgers, Pammy's Wild Rice Salad, and Nina's Wild Mushroom Tart. 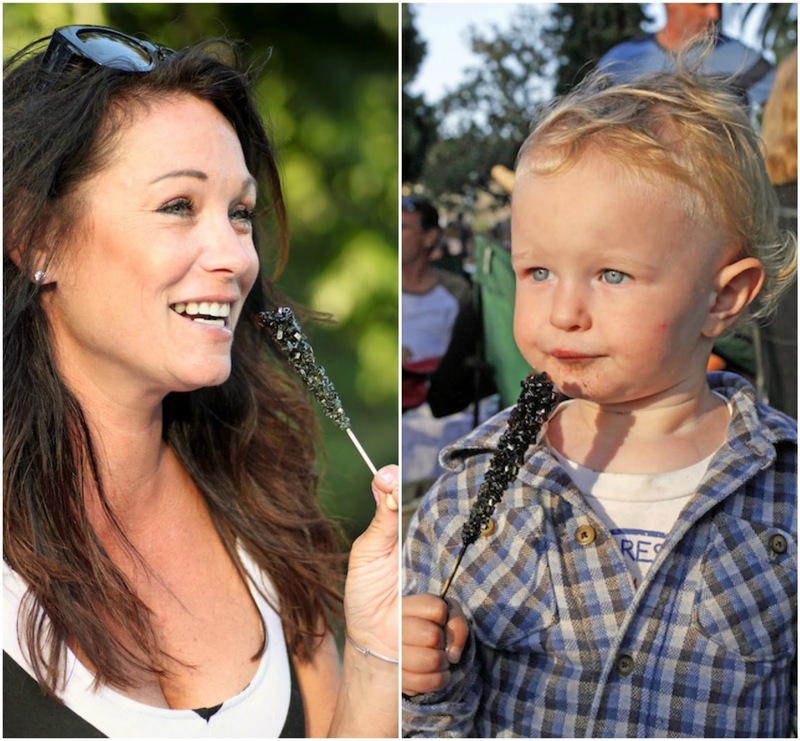 Holli also brought rock candy for the kids. We had several more dishes, including Kelley and Bryan's meatballs and ribs, Mary's fruit and cheese platter, Brad's chicken skewers, carrot cake, and strawberries, but I was so relaxed from drinking wine from 3:00 on that I didn't get around to photograph, document, and taste everything. If you wish to make the most decadent chocolate Rocky Road Cheesecake, head on over to Bakers Royale for the recipe. I followed Smitten Kitchen's post to make the World Peace Cookies used in place of Oreos for the crust. For the chocolate ganache, I followed Ina Garten's recipe because I like the addition of a little heavy whipping cream to make the ganache smoother and a teaspoon of instant coffee granules for the flavor. I also used a 6 x 3-inch springform pan, rather than an 8 x 2-inch for a taller cheesecake. Sue Palmer, Queen of Boogie Woogie, and her band return to the park on Sunday. I promised Bryan we would do South African cuisine before the season ended, so that's our theme. I've got a few ideas from Planet Barbecue cookbook but just wish I had time to order crocodile. Aiye, the Ramen Burger!!! It's everywhere!!!! Unique and fun, but does it really work? Like does it hold the patty and taste okay?